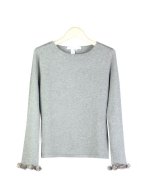 Silk/cotton/cashmere jewel neck short sleeve sweater knitted in 14 gauge flat knit. 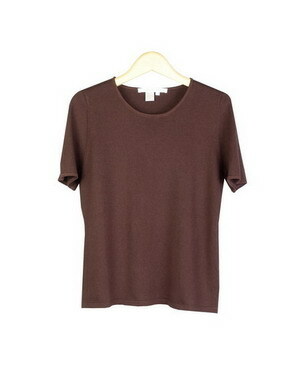 This short sleeve sweater has very good hand-feel and soft touch. 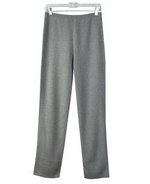 It drapes well and gives a slim look and a comfortable fit. The sweater matches all the knit jackets in this group collection. 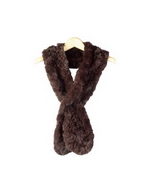 It is also a great sweater item for the fall/winter seasons to wear under any jackets and blazers. Sizes from S(6) to Large Size 1X(16W-18W) are available. Dry clean for the best long lasting results. Or handwash cold and lay flat to dry; Then press with steam or just steam to enhance the silk/cotton/cashmere/lycra blends soft-touch and good feel. Mid hip length. 3 colors available: Black, Brown, and Snow Gray. 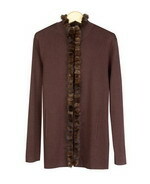 Silk/Cotton/Cashmere/lycra flat knit sweater-jacket w/removable rabbit rur collar & belt design.